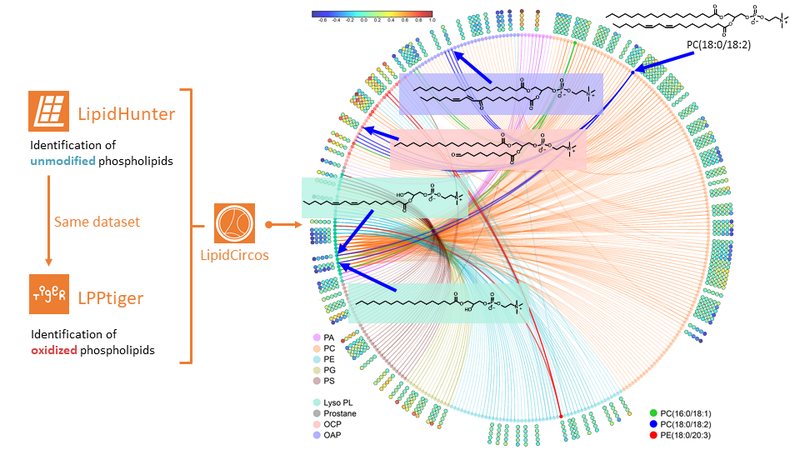 LipidCircos can generate Circos plot based on the identified unmodified and corresponding oxidized phospholipids. The circos plot can visualize the relationships between unmodified phospholipids and their oxidation products, and thus can be used as an informative resource to investigate phospholipids remodeling under experiment conditions. LipidCircos is a pure python program, which requires certain programing knowledge to perform the analysis. A more user-friendly version with graphic user interface will follow soon.